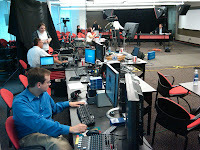 We produced a two-day live streaming event last week, wrapping late in the date on Thursday. The client normally has a two-week road show every year to present business plans for the coming year to different U.S. regions. After much planning and testing, we replaced the road show with a two-day meeting streamed in real time to about 40 office locations. It gave the presenters "two weeks of their life back"! This was a great collaboration and we look forward to doing more of these kinds of events as more companies embrace streaming video technology. Since we're catching up on old news on our new blog, we wanted to be sure to post our most recent holiday video! Our 2007 holiday video was a lot of fun to produce! 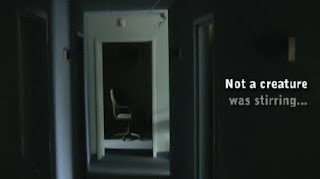 Can you imagine having secret cameras around YOUR office! More Capabilities and More Awards! EventStreams announces more award-winning videos and new interactive capabilities! ES client, the Atlanta Bar Association, wins an international ACLEA Award. ES wins two Aurora Awards for productions for Agilysys and the Centers for Disease Control and Prevention. ES adds Interactive Flash Programming to our skill set. The international Association for Continuing Legal Education (ACLEA) honored the Atlanta Bar Association (ABA) with an Award for Outstanding Achievement for Lincoln on Professionalism in the Best Program category. It is one of only 15 annual awards granted to competitors representing more than 300 organizations. EventStreams worked with the ABA’s Lincoln Committee to produce a series of ten videos in the documentary style of filmmaker Ken Burns. The videos are used by the ABA in a comprehensive CLE program that is available for purchase by other bar associations throughout the country. ACLEA will formally present the award to the Atlanta Bar Association at the Annual Meeting of ACLEA in Salt Lake City, Utah on July 28, 2009. Call us at 404-816-1114 to see this video series. EventStreams is honored to receive two Gold Aurora Awards for Agilysys IBM Technology Solutions and CDC: Healthy Community Design. The Aurora Awards is an international competition designed to recognize production excellence in the film and video industries. The Centers for Disease Control and Prevention uses the CDC: Healthy Community Design video to help explain in plain language how community design affects health. It is included on the Healthy Community Design website and provided to Smart Growth advocates on DVD. And in other news, we are very excited to announce our new partnership with Matt Morrison! This significantly expands our capabilities in web design and development, and allows us to provide interactive Adobe Flash and Flex-based applications to support your video-based marketing, training and communications efforts. Matt brings fresh creative insights and a technical skill set that is in high-demand today. Design is limited only by your imagination! Call us at 404-816-1114 to schedule a demo and discuss your ideas. Nate and team shot some extra footage during the ACVB/MPI video for the 2009 Meet Different conference here in Atlanta. So...what would anyone do? We produced a short "behind the scenes" video. This month EventStreams won a bronze Telly Award for its work with the Atlanta Convention and Visitor’s Bureau (ACVB) to promote Atlanta as a top meeting destination. Meeting Professionals International (MPI) hosted its annual MeetDifferent conference in Atlanta in February 2009; the last time this conference met in Atlanta was in the 1990s and many new and wonderful additions have been made to the city. ACVB challenged EventStreams to create a promotional video to build attendance for the 2009 conference and show that Atlanta knows all about “Meeting Different.” The message also needed to remind meeting planners that, yes, Atlanta is a business city, but we also know how to have fun in unique and different ways. We wanted to remind them of all the many things to do in Atlanta. EventStreams dove into the assignment and produced a fun and unique 45-second spot that included an underwater shoot at The Georgia Aquarium. MPI and ACVB used the video in several marketing efforts, including featuring it on www.atlanta.net and in an email marketing campaign. ACVB has also permanently posted the video on their website to highlight Atlanta’s “meeting” potential. With over 13,000 entries from the U.S. and countries around the world, EventStreams is honored to accept the Telly award and proud to represent an award winning piece. It is on display in our Atlanta office; be sure to check it out the next time you stop by! Founded in 1978, the Telly Awards is the premier award honoring outstanding local, regional, and cable TV commercials and programs, the finest video and film productions, and online video. The Telly Awards annually showcase the best work of the most respected advertising agencies, production companies, television stations, cable operators, interactive agencies, and corporate video departments in the world. ACVB is the liaison between meeting planners, tour operators and its 1,200-plus member organizations. The Bureau positions Atlanta as the leading destination for conventions and tourism through aggressive sales and marketing programs. ACVB's efforts support Atlanta's $11.4 billion hospitality industry, 230,000 jobs for metro Atlanta’s and 37 million visitors each year. EventStreams produces high-quality video and we excel at delivering it online, to our clients' external audiences as well as internally to employees. We pride ourselves on supporting our clients' strategic communications objectives with video that motivates, educates or changes a viewer’s perception. EventStreams is honored with two Silver Flame Awards! Atlanta, GA (October 21, 2008) - IABC/Atlanta awarded EventStreams for being among Atlanta's top communications talent in both the "Video - Nonprofit" and "Video - Other" categories for client projects produced in the past year. EventStreams winners include: St. Luke's Presbyterian Church "Just Imagine Campaign" and Cox Enterprises "Jim Robbins Memorial Webcast." The Golden Flame Awards is a yearly event held by the IABC/Atlanta chapter recognizing excellence in communications in a variety of categories, including print media, electronic media, graphic communications and media relations. IABC/Atlanta is a local chapter of the International Association of Business Communicators, headquartered in San Francisco, California, representing approximately 300 professional communicators in the metropolitan Atlanta area. Members include public relations and communication professionals from Fortune 500 companies, small businesses, communication agencies, nonprofit organizations, government agencies as well as freelance writers and consultants. We are pleased to announce secure video streaming now available to all of our clients! Secure streaming enables you to deliver content to authorized users in a secure manner. Our corporate clients can now host videos securely without adding streaming video servers. Companies developing syndicated or subscription-based content can easily add a pay-per-view system. EventStreams hosts all videos through the Akamai Edge technology platform to provide anytime, anywhere access. The Akamai network provides you access to the world’s most extensive video streaming network and gives you the ability to provide your content to an unlimited worldwide audience. Hosting your videos through EventStreams provides you access to the Akamai network without requiring a long-term hosting and storage contract. We manage the back-end file management and storage for you on a per-project basis. Secure streaming leverages the existing Akamai reporting services to provide comprehensive information back to each client. Call us to learn more about secure streaming for your online videos! EventStreams wins 6 Aurora Awards! This just in…six recent EventStreams video projects are Aurora Award winners! The Aurora Awards are an independent film and video competition for commercials, cable programs, documentaries, industrial, instructional and corporate videos. Thank you to all our clients for your partnership and confidence in our team. We look forward to producing more award-winning projects with you in 2007! EventStreams helps clients win awards! ATLANTA - EventStreams clients Jewish Federation of Greater Atlanta and Powell Goldstein each recently won an award for communications efforts including streaming video. JFGA placed second in the “Best Online Event Registration Category” from the International e-Philanthropy Foundation for its online marketing efforts supporting the Jewish Community Centennial Celebration at the Georgia Aquarium in February, 2006. Event registration was handled entirely online. An email registration pull-through campaign included a light-hearted streaming video featuring Home Depot founder Bernie Marcus and past JFGA President Linda Selig at the Georgia Aquarium. Powell Goldstein won first place in the “Business Development Initiative Category” from the Legal Marketing Association Southeast Chapter for its InterAction Skits. The skits were designed to educate attorneys and secretaries how to effectively use InterAction CRM Software to improve client service, increase firm productivity and to capitalize on new business opportunities. EventStreams recorded and edited the skits, turning them into a training and development piece for new hires. EventStreams produces corporate videos for marketing, promotions, tradeshows, global best practices, employee communications and e-learning. We deliver on the medium that best suites each project, including streaming, progressive downloads, flash, DVD, thumb drive and CD. For more information about EventStreams visit www.eventstreams.com or call 404.816.1114.